Want to be notified of new releases in marekhoeven/VANO? A NANO light-wallet browser extension. It works with NANO, a fast & fee-less currency secured by a decentralised network. The wallet stores all sensitive data locally (encrypted) and never communicates it to a server. 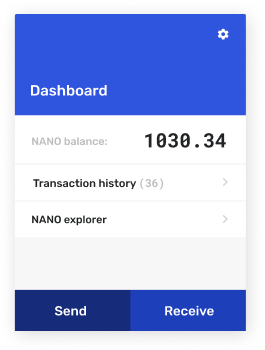 VANO is still in beta, do not store large amounts of NANO on this wallet! The extension requires read/write access to allow for deeplink recognition on a browser. If detected, clicking on a deeplink will automatically open a popup with the amount & address filled in, ready to be send. This feature currently only works for Chrome/Brave users (showing a popup on firefox seems to be difficult). You can test deeplinks on my DEMO page. Vano is now installed locally (don't remove the unzipped folder, otherwise the extension won't run anymore) and can be used together with deeplinks. Build the extension into dist folder for production. Build the extension into dist folder for development. Watch for modifications then run npm run build. Watch for modifications then run npm run build:dev. It also enable Hot Module Reloading, thanks to webpack-chrome-extension-reloader plugin. Keep in mind that HMR only works for your background entry. Build a zip file following this format <name>-v<version>.zip, by reading name and version from manifest.json file. Zip file is located in dist-zip folder. Perhaps select what specific individual pendings to accept? Special thanks to the following repo's. You made the creation of this extension a lot easier. Thank you!